I have always been fascinated by fast cars, advanced planes and spacecraft and there is a thread running through my interests which I have been able to explore while creating my “Life Wall” – http://atate.org/ as part of the MSc in e-Learning Digital Cultures course – so this blog post fills in some background. Many members of my family have been involved in motorsport at a number of levels, and I got the bug early on. I had a scrambling motorbike that we used in fields adjacent to our house in Knottingley, West Yorkshire, and later developed a drag racing sprint bike that we raced at Riccall aerodrome on Drag Racing weekends with the North of Britain based British Quarter Mile Association (BQMA). I was already a rally car navigator for my older brother, Morris, on local De Lacy Motor Club events before I could legally drive myself. I can read a map as if its a 3D model laid out before my eyes. We were taught to drive by my dad in our field and on local aerodromes, and I used my brother’s (fast racing) go-kart a few times. Scary to be that close to the ground at nearly 100mph. I passed my driving test almost as soon as I was 17, joined the De Lacy Motor Club and competed in local rallies and driving test and motorcross, and I have a few trophies to show for the effort. But my interest in fast cars and vehicles went beyond that. I loved the engineering cutaways shown in the “Eagle” comic each week, and I followed a number of UK and US Hot Rod and Drag Racing communities via magazines. I was lucky to be taken by my elder brother to see the first visit of the US Drag Racing Team to the UK, who brought over the dragsters then just touching 200mph from a standing start in a quarter mile sprint. Don Garlits, Don Prudehome, Tony Nancy and the other famous racers of the 1960s were all there when I saw a 200mph run at RAF Woodvale in Lancashire. I was an avid follower of the fascinating battle for the land speed record in the US between Art Arfons and Craig Breedlove as they went through 400mph, then 500mph and then 600mph in the space of a couple of years. My dad took us over to see Donald Campbell doing some of his trials runs on Coniston Water in the UK Lake District. I continue to follow the more recent land speed records attempts and have been a supporter of Richard Noble and Andy Green’s supersonic record car in 1997 with my name being carried in certificates in the car as it did its runs at Black Rock Desert in Nevada. I now support the new Bloodhound SSC car being designed to do 1,000mph. My name will be on its tail. The early 1960s were a good time for those interested in fast planes and supersonic or hypersonic travel – with the X-15 rocket plane able to do hundreds of flights straight up into space and back on a ballistic trajectory. We are only just getting back to the time that will be reasonably feasible again with Virgin Galactic’s SpaceShip Two. Though it was not something that was known about to the general population in the 1960s, it later transpired that the SR-71 Blackbird was routinely flying at Mach 3 or more for many hours on high altitude spying and scientific missions since the 1950s. I still find the SR-71 the most beautiful aircraft and take every opportunity to visit one in the museums around the world as I travel. And I take one for a spin any time I can in Flight Simulators. So with these interests, its not surprising I was also interested in space. I was interested in space before sputnik flew, and already had (and still have) a well thumbed copy of Patrick Moore’s “Boys Book of Space”, with pencil drawings of the features of the moon in the back from my pre-teen years. 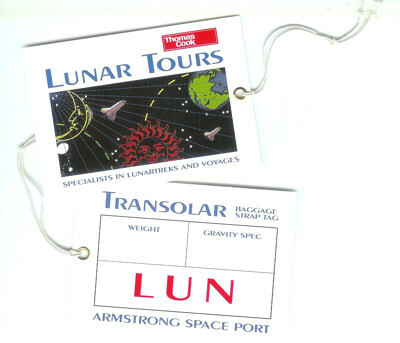 I lived through the early Space Race years, and have my collectors cards that went from Sputnik up to visionary deep space probes and talk of a “Grand Tour” of the solar system which I loved the idea of. It would be some years before my AI planning software was used by NASA JPL as a basis for Steve Vere’s Deviser planning system that would (after its launch) model the activity of the Voyager spacecraft which actually flew this Grand Tour mission, and continues to send tweets which I receive each day of its position far beyond the Solar System edge. I have ready to use luggage labels (issued for promotional purposes) when I registered my interest in Thomas Cook flights to the Moon! I am a Fellow of the British Interplanetary Society which is a fantastic way to stay in touch with space related activities as an amateur. But I have also worked professionally with the European Space Agency consulting on autonomous spacecraft, and worked on projects with them on planners for the ERS-1 spacecraft and a system for assembly, integration and test of Ariane launchers. Our work at AIAI has also fed into telecommand systems for EUMETSAT meteorological spacecraft and for ground station planning for the UK Skynet observation spacecraft. One thing we have found to be a great way to stay in touch with missions has been to place our name on lists carried on CDs, chips or plaques on board exploration spacecraft. We have had our names on the Opportunity and Spirit rovers now on Mars, and our name was carried on a chip on-board the return capsule on Stardust sample return mission to Comet Temple 1. The chip should be in the Smithsonian museum in future. Our names were also on the Deep Impact comet penetrator mission. Our names and photos (and those of my virtual world avatar after an invitation from a NASA Colab group I am part of in Second Life) have flown on each of the last flights of the Space Shuttle in the last 12 months. Unfortunately, we just missed seeing one launch while in Florida after a launch scrub, but did visit and see the penultimate Space Shuttle Discovery on its pad at Cape Canaveral. But in the past we have seen two shuttle launches. 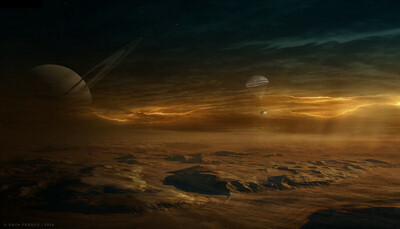 And we will shortly be off to Mars again on the new “Curiosity” Mars Exploration Lab. But perhaps the one I find most interesting, is that our names and a poem I wrote were carried alongside other digital artifacts on board the European Space Agency’s Huygens Titan lander taken by the Cassini spacecraft to Saturn. All contributors were provided with a copy of the whole set of artifacts by ESA when the content were completed before launch. We followed that whole mission. Huygens drifted down through methane clouds gently to land in soft terrain on the shores of a liquid methane lake overlooked by the rings of Saturn through a hazy sky. Drift down through the clouds… We’re with you.